Since its creation in 1978, Logopak has become world leaders in labeling by offering the highest performing print & apply labeling system on the market. Known for its speed, precision, and durability, these fully integrated labelling systems are able to meet the most demanding needs. The efficient design and robust construction allow these machines to outperform and outlast the competition. Simply put, Logopak systems are built to provide dependable performance day after day, month after month, year after year. Industry Leaders: Founded in 1978, Logopak invented print and apply labeling and has grown to become the trusted market leader worldwide with over 5,000 customers and 12,000+ systems installed world-wide. Full-Service: LOGOPAK is the only group to offer full-service of hardware and software. North American network of exclusive and experienced distributors provide local sales, service and support, augmented by LOGOPAK factory technicians. Remote maintenance and support is just a call away with Control Center via Webmaster. Robust Design: This is not your standard labeling machine. Our labeling systems are rugged-built machines with a proven life of 10+ years of continuous use and abuse. This industrial labeling system will be giving reliable performance well beyond a decade; it is nice to have that kind of peace of mind. Industrial Construction: Logopak has a holistic approach to manufacturing and construction with vertical range of manufacture of more than 90%, exclusively in Germany where all systems are developed, produced, and tested. High-Speed: Our systems provide you with the speed to truly label in real-time. 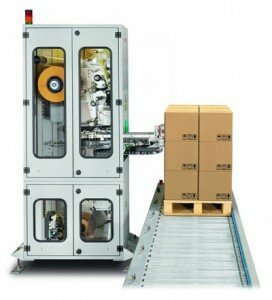 Pallet labelers reach speeds up 120 pallets per hour and tray labelers hit an incredible 120-240 trays per minute. Custom Solutions: We offer you custom-engineered solutions to meet your specific requirements and exceed your expectations. We feel that there is no project too complex and our team always welcomes the challenge. Guaranteed Parts: We offer a 10 year guarantee on the availability for spare parts on all Logomatic system. All wear and spare parts, including print head, are available when you need them. Superior Print Engines: We do not use desktop printer components. Our robust print engine system is designed specifically for the most punishing industrial conditions. Desktop engine based systems, used by many of our competitors, typically last only 2-4 years before needing replacement and often require regular maintenance every 6 months. Our rugged design has proven life of 10+ years in high-cycle applications. Integrated Rear Drive: Our integrated design utilizes an industrial knurled steel rear-drive assembly set in steel bearings and 10mm aluminum casing, not a front ‘push drive’ with plastic bushings like desktop engines. This means no more label jamming, roller wrapping or dropped labels. 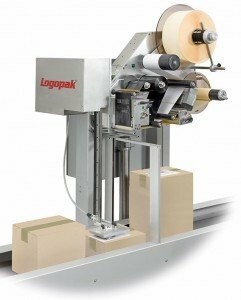 Long Run Times: Logopak utilizes 600m, 800m and 1200m rolls of thermal transfer ribbon – competitors’ desktop engine-based systems typically use 450m rolls – which means more run time between roll changes with Logopak. RFID Capable: All Logopak labeling systems can be equipped with RFID technology (HF and UHF), even after installation. Flexible Integration: Logopak provides you with the optimum solution. For all of our machines, software and data-based communications are developed and owned by Logopak. We can configure any of them to meet your specific needs. In addition to Logopak’s in-house software development, a full suite of standardized PC applications available for: label design, machine networking, data backup, traceability, data administration, synchronization of data records, ZEBRA emulation, and SATO emulation. Operating at speeds up to 120 pallets per hour, we are able to accommodate oversize, variable height, and double stacked pallets with ease. Built to order, each pallet labeler is tailored to meet your exact specification and needs. Their operation is smooth and reliable and will withstand even the most unforgiving conditions. The standard enclosure, featuring automatic trap doors, keep the harshest environments out and keep you production running smoothly. Our middleware and verification systems provide additional piece-of-mind by ensuring the correct label or labels (some applications have as many as 6 labels on one pallet) are applied to each pallet. Labels are verified within our industrial print head or even through the integrated scanner on the applicator to ensure the correct label is applied and orientated as it should be. With such an intelligent and integrated solution, we are able to provide companies with a highly efficient and reliable interface between production and logistics. Logopak’s high-performing print and apply labelers provide accurate, reliable, and unswerving performance even at the high speeds of 120-240 trays per minute. The robust construction and precision components surpasses the most demanding needs and rigorous conditions. With our systems, you can focus exclusively on your own product. Thanks to the modular design of our labelling systems, all basic assemblies can be equipped with a range of applicator versions. Our machines can be easily adapted to suit your requirements. In addition to our systems, we offer you a wide range of labels and thermal-transfer ribbons, Logopak uses high-quality consumables designed for use in industrial environments and high-resolution printing technology. We supply simple paper labels, polyester and polypropylene labels as well as special labelling materials for virtually all applications and products. Whether you wish to use paper or plastic labels, standard glues or special adhesives – contact us for advice!